Why is My Squash Wilting? Why is my squash wilting? Assuming you have been giving your vegetable garden adequate water, the Squah Vine Borer may be the cause. Unfortunately presence of the squash vine borer, the larval form of a clearwing moth, is usually noticed only after damage is permanent. Prevention is possible with early recognition through vigilant scouting. 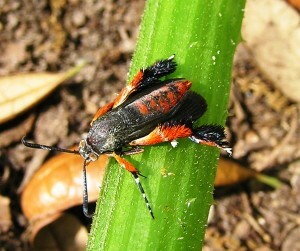 The adult moth is common in gardens throughout Northwest Florida, and is easily recognizable due to its black and orange coloration.The 1/2 inch moth is active during the day and will lay a single tiny orange egg at the base of healthy squash plants. 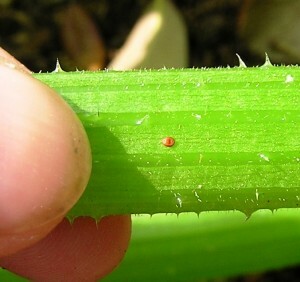 It only takes a week for the egg to hatch and for the larva to bore into the stem. Once the larva in inside the stem, it chews its way up the stem, blocking the transport of water from the roots to the shoots. By the time wilting is noticed, total blockage of the water conducting tissue (Xylem) is likely. If the moth is noticed in the garden, preventitive application of Bt (Bacillus thuringiensis) or pyrethroid (permethrin or bifenthrin) insecticide to the base of the stem may stop their incursion into the vine. Yellow traps full of water can be put out to monitor for them, since they are attracted to anything yellow. If the vine is already affected, insecticide applications will not help. There is a slim chance of saving it by cutting out the larva. While performing this task make sure to preserve the stem and bury the stem of the plant in a few inches of protective soil. The plant may grow new roots and resume production. 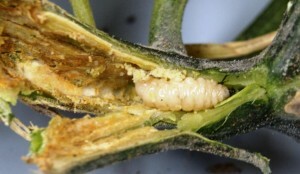 For more information about the Squash Vine Borer, proceed to this University of Kentucky article. To learn more about pests of Cucurbits, check out this informative UF / IFAS publication, Insects Management for Cucurbits. What’s Killing My Magnolia Leaves? 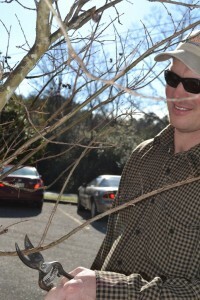 We love our native magnolias in part because they are tough, easy to care for trees. The mainstay of southern gardens, they grace us with attractive thick, waxy leaves year round and sublimely fragrant and graceful blooms. 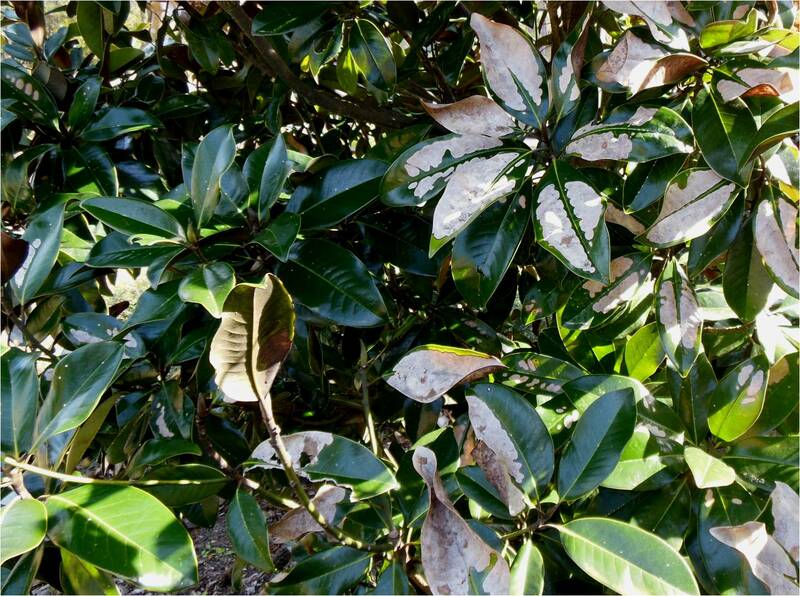 However, this past spring brought conditions that encouraged a fungal leaf disease known as anthracnose, most noticeably on the southern magnolia, Magnolia grandiflora. 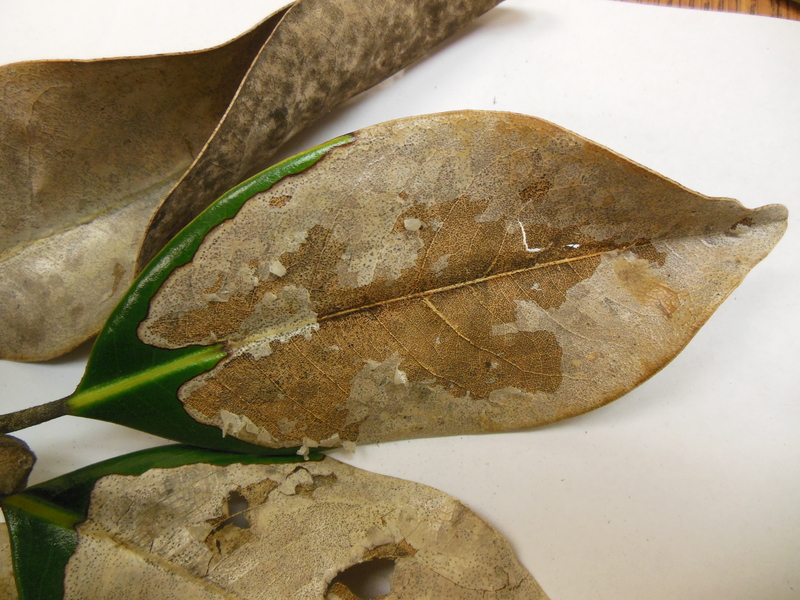 Affected leaves develop large irregular dead patches with a clearly defined border. The dead patches are a brownish gray and will flake and eventually deteriorate and fall away from the rest of the leaf. Fortunately it is rare for the disease to affect all branches of the tree and infection is somewhat spotty as you can in the photograph below. Conditions that favor the development of anthracnose in magnolia are the cooler, moister conditions that the panhandle experienced this early spring. Spores overwinter on affected branches and in leaf litter and travel to their new hosts through rain, wind and splashing water. But in order to avoid another infection next spring, remove and dispose of as many affected leaves as possible from the tree and certainly those that have fallen. Avoid irrigation that wets the leaves because the consistent presence of moisture on the leaf is a perfect incubator for anthracnose. Ensure that there is sufficient air flow around the trees. Fungicidal treatment is generally not warranted. Bigleaf Hydrangea (Hydrangea macrophylla) are familiar faces in the southern shade garden. Although not originally from North America, they were introduced here over 200 years ago and perform well in the climate of the Florida Panhandle. Here are some quick tips about Bigleaf Hydranges. Flowers may be white, pink, purple, or blue; flower color is influenced by soil conditions and you may see multiple colors on the same plant! 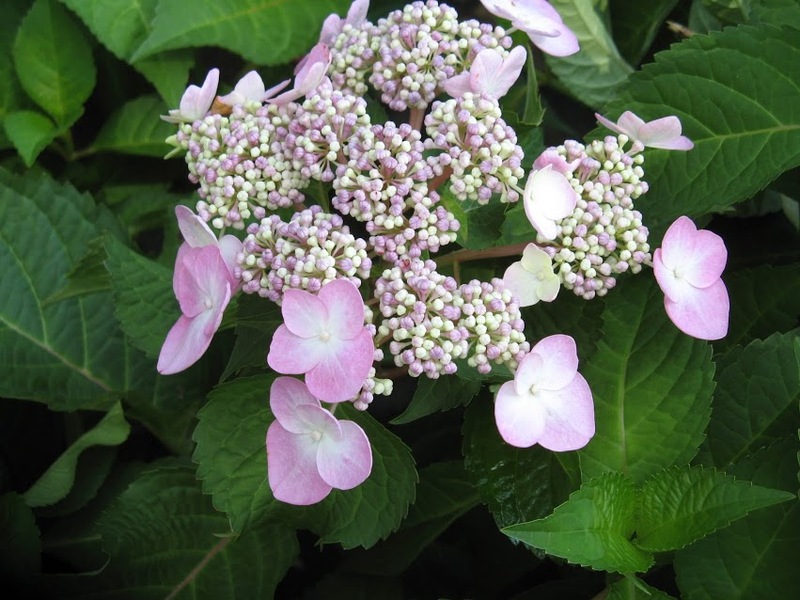 Bigleaf hydrangeas generally bloom on old wood, however, there are some types that will also bloom on new wood and fall into either “free-flowering” or “everblooming” categories. Free-flowering have flower buds on the tips of branches (old wood) and develop flower buds up and down the stem that flower after terminal (tip) buds flower. 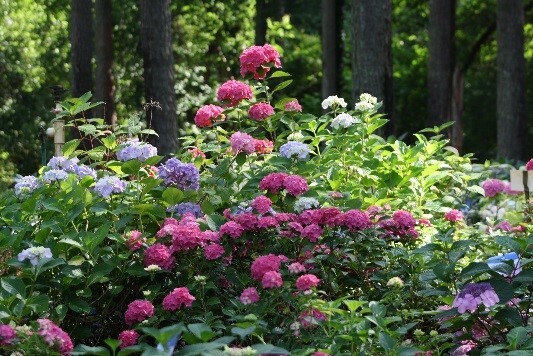 Everblooming hydrangeas form flower buds on the tips of both old wood and new wood and can flower throughout the season. 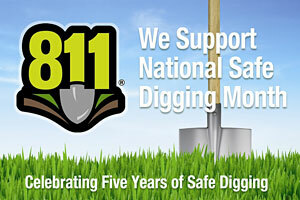 This month, recognized by the Senate and Florida’s governor, reminds diggers why calling 811 before all outdoor digging projects is important to your safety. Before installing a mailbox, fence, deck, garden or tree make sure to call Sunshine 811 to have underground lines marked. 811 is the free national number designated by the Federal Communications Commission. It notifies utility companies, who in turn send their professional locators to identify and mark the appropriate location of underground line with paint and flags in colors that identify the utility type. The following colors represent the seven various utilities: red – electric, orange – communications (telephone, cable tv), blue – potable water, green – sewer, yellow – gas, purple – reclaimed water, and white – site of intended excavation. 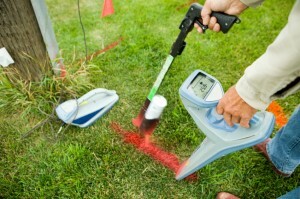 To learn more about color designation and their corresponding utility go to: http://www.call811.com/faqs/default.aspx. Locate marks are good for 30 calendar days. Any work beyond that requires another call to 811. If the marks are destroyed before your project is done, stop digging and call 811. Hitting an underground utility line while digging can cause injuries, utility service outages to an entire neighborhood and damage to the environment. The depth of utility lines varies, and there may be multiple utility lines in one common area. Even if you think you know where an underground line is, time tends to change things. Erosion or tree roots can shift those utility lines. Failure to call before digging results in one unintentional utility hit every eight minutes nationwide. You could also be financially affected with costly fines and high repair costs. The Common Ground Alliance (CGA) Damage Information Reporting Tool (DIRT) provides industry stakeholders with a way to anonymously submit data into a comprehensive database for analysis of the factors that lead to events. An event is defined by the CGA DIRT User’s Guide as “the occurrence of downtime, damages, and near misses.” The number of events submitted to DIRT for 2011 totaled 207,779. However, according to CGA DIRT “when a call is made to the one call canter (811) prior to excavation, 99% of the time there will be no damage”. Calling 811 in Florida is the law. At least two full business days before digging, do-it yourselfers and professional excavators must contact 811 by phone to start the process of getting underground utility lines marked. This is a free service. Be sure that all utilities have been marked before grabbing the shovel. If you don’t see locate marks, don’t assume there are no underground utility lines. Verify with the Sunshine 811 Positive Response system. Follow up on your one call ticket by contacting 811 again on the third day. Sunshine State One Call is a not for profit corporation which began with the 1993 adoption of the “Underground Facility Damage Prevention and Safety Act,” Chapter 556, Florida Statutes. Online you can visit: www.online811.com, or call (800) 852-8057. If you provide a valid e-mail when requesting your locate ticket, positive response updates will automatically be sent to you when all utilities have responded. For more information on Florida’s law, visit www.Sunshine811.com. 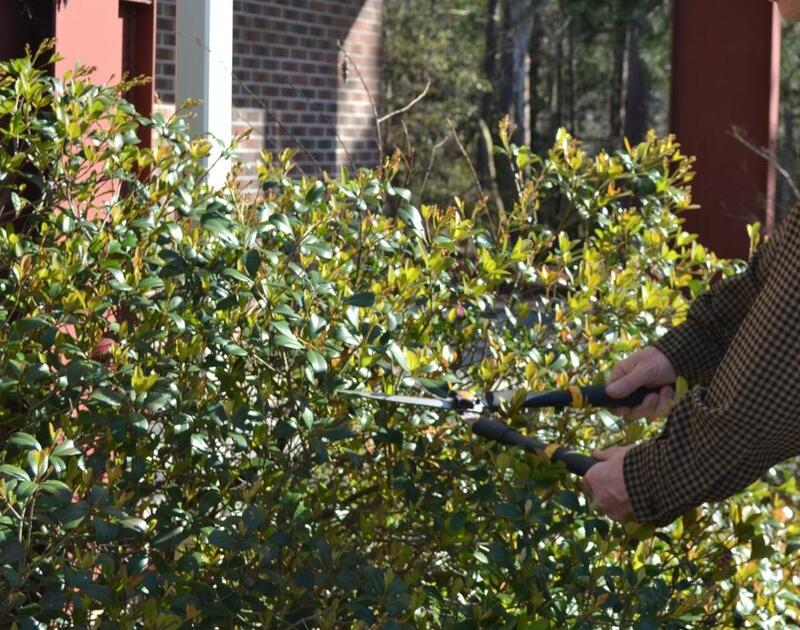 As spring approaches, many gardeners get out the pruning shears and prune everything in sight. That might not be the best course of action! 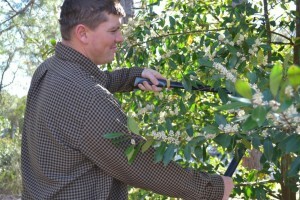 Take a look at these tips for flowering landscape shrubs to learn more about pruning techniques that will maximize amount of bloom. • Prevent potential damage (overlapping branches, poor crotch angles, diseases, etc. • Corrective pruning due to injury or dead tissue should be done as soon as evident. • Avoid pruning from August 15 until plants are dormant. • Most pruning should be done during the dormant season or immediately after flowering. • If the plant blooms after May 1, prune during the dormant season (flowers produced on new growth: Crape Myrtles, Lilac Chaste tree, etc.). • As with any rule there are exceptions: Oak leaf Hydrangea. • Local in affect (usually within 6” of cut). • Cuts should be made ¼” above a bud or to a crotch (Lateral branch). • Cuts should be made at angles. • Keep equipment clean and in good repair. • Keep equipment within your control zone. Don’t over extend, know the limitations of your equipment and yourself. • Know your surroundings (overhead utilities, other workers, etc.). • Be able to identify Poison Ivy, Poison Oak, and other skin irritants. 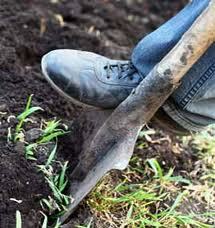 • Pruning: Remove dead wood and seed pods annually during the dormant season. • Size control should be done by cultivar selection, not by pruning. • To promote a second set of flowers, prune away faded or spent flowers throughout the season. 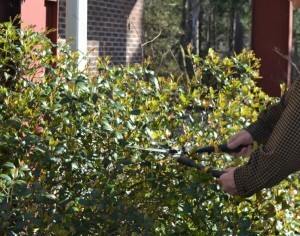 For more information, click here for a UF / IFAS Extension publication on proper pruning techniques. If you have any questions contact your local county extension agent. Magnolia flowering has been exceptionally good this year. 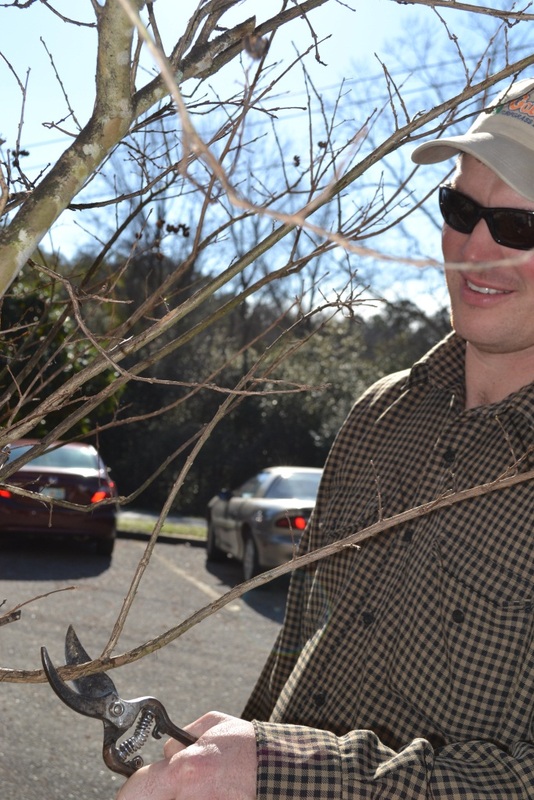 Mild temperatures have coaxed “Japanese” magnolias into bloom as much as 4 weeks early. Fortunately the absence of hard freezes (so far) has allowed us to fully enjoy magnolias’ beautiful flowering. ‘Jon Jon’ has large buds that develop into goblet-shaped flowers the first day, gradually opening as wide as 12 inches in diameter (though 8 inches is more typical). 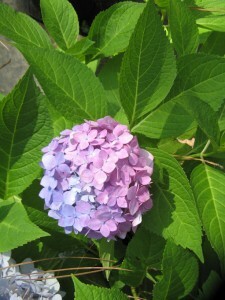 Flowers are creamy white with a reddish-purple blush at the base. ‘Jon Jon’ grows into a small tree about 20 feet tall. Peak bloom in north Florida typically occurs March 2, based on 10 years of flowering data at the University of Florida research center in Quincy, Florida. ‘Jane’ has red-purple buds that open into cup-shaped flowers 3 – 4 inches in diameter, pinkish-purple on the outside and white inside. It grows as a large rounded shrub or small rounded tree. Based on UF-Quincy data, peak flowering occurs March 17. ‘Ann’ has rich, dark red-purple buds that open to red-purple flowers about 3 inches in diameter. A sister of ‘Jane’, ‘Ann’ similarly grows as a large rounded shrub or small tree. Peak flowering is March 20. Amazingly, ‘Ann’ produces flowers sporadically all spring and summer! 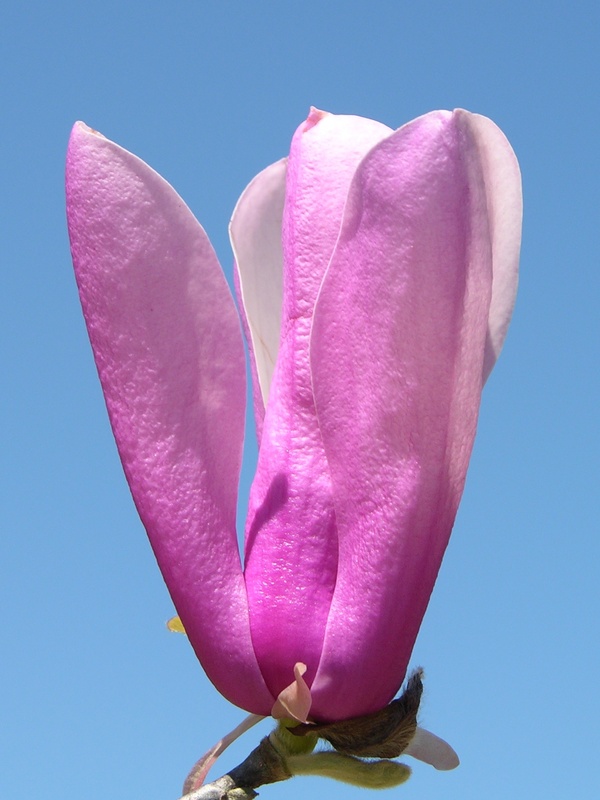 When purchasing a magnolia, look for a healthy plant with evenly spaced branches. A container-grown plant can be slipped out of its pot to inspect the roots. Healthy roots are yellow-white, whereas diseased roots are brown to black and often have a sour odor. Magnolias prefer a spot in the garden that receives full sun to light shade, ideally with shade from the hot afternoon sun. If possible, avoid exposed, windy locations because strong winds can damage large flowers and the typically brittle branches. Magnolias grow best in moist, well-drained, slightly acid soils but neutral to slightly alkaline soils are also suitable for growth. 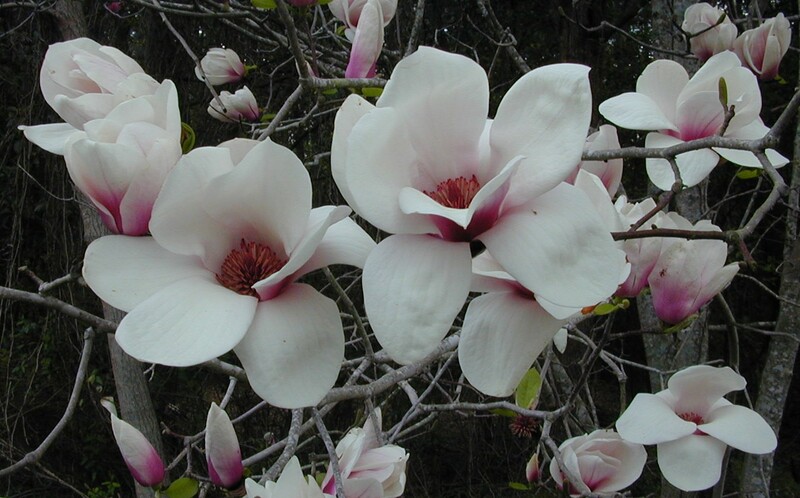 Magnolias are adaptable to clay, loam or sand soils, but grow poorly in wet or poorly drained soils. Well-established plants can be moderately drought tolerant. Add a magnolia to your yard today and you can enjoy spectacular spring flowers for years to come! 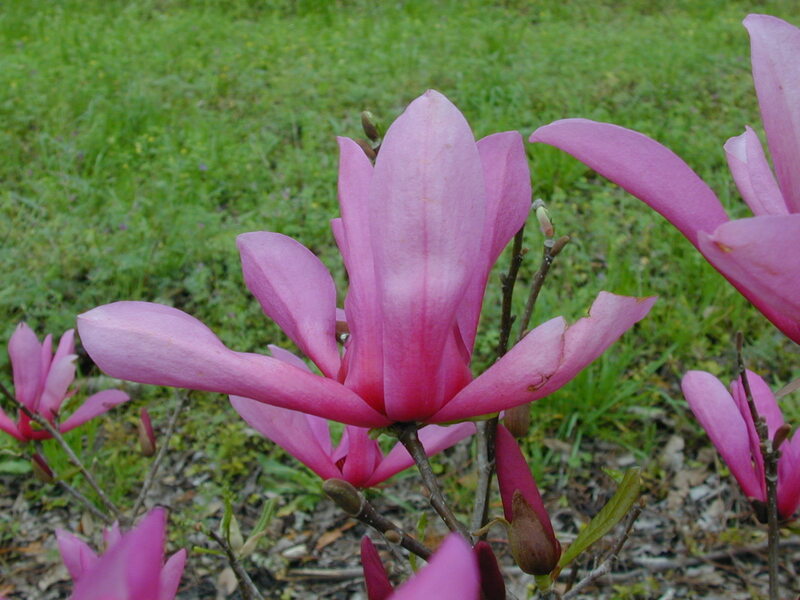 For more information, visit http://edis.ifas.ufl.edu/ep453, ‘Jon Jon’ Magnolia: A Late-Flowering Deciduous Magnolia for Northern Florida, or http://www.magnoliasociety.org/, the website of Magnolia Society International.